After rulling out the idea of putting my bike on the top of the car, on a Sunday morning I left Bucharest pedalling towards Giurgiu. There are 34 kilometres from the Bucharest exit to the entry into Comana locality. The first 17 kilometres on the E70 road are filled with common sights and require increased attention because of the traffic. After that, although the road continues on asphalt, senses can relax. Far from the car burden of an European road, you'll pass by small and dry villages: Varlaam, Mogoșești and Grădiștea. The sheer image of the rural life in a plain area accompanies the traveller like a good road companion. On that road, you can feel the locals are watching you from their porches – after all, you bring along the unfamiliar image of a lone bike rider: helmet, dark glasses, tight pants, gloves, small backpack. You pedal along, hungry for images and anxious to escape the grey drift of the asphalt and to see for yourself the forest you've heard is so different from the Baneasa and Mogosoaia ones. And to find less beaten paths. to have stopped: an old boat floats on the water, thousands of mosquitoes dance on the lake. It is the perfect scenery and the silence of the place is what you have been dreaming of every day in the noisy Bucharest. In the middle of Comana, you take the right left turn, finally leaving the asphalt and entering a forestry road. 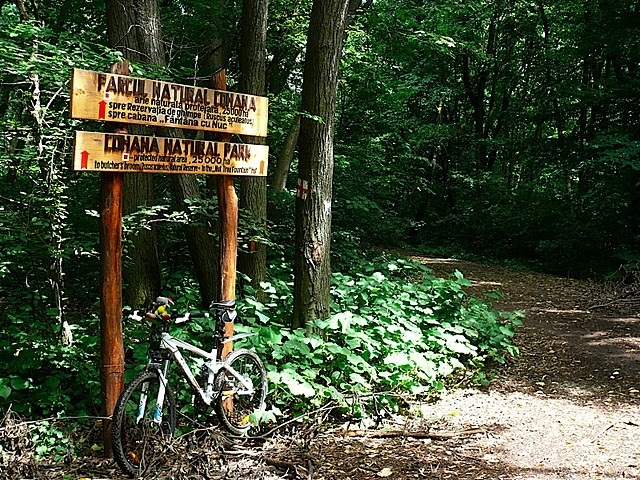 You are already in the Vlasiei Forest, in the Comana Natural Park. The sound of millions of insects swarming in the forest invades the ear. The density of the woods, the lights and shadows game through the trees, the long roads on humid ground, numerous crossroads and the lack of certainty about whether you follow the right path turn this one day adventure into something more exciting that you would have imagined. After going around in the forest with no road signs, without meeting anyone on the way and with the clear though I would not find the heavenly area I was imagining the lake dwellings to be, I left my bike near a tree, in an area filled with high rush-bed. 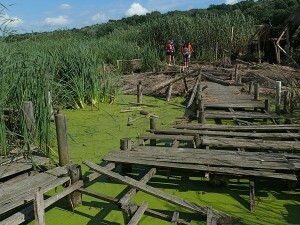 I took cautious steps on the decayed wooden foot bridge, amidst the rush-bed and the hair weed. Every step turns into a small adventure. 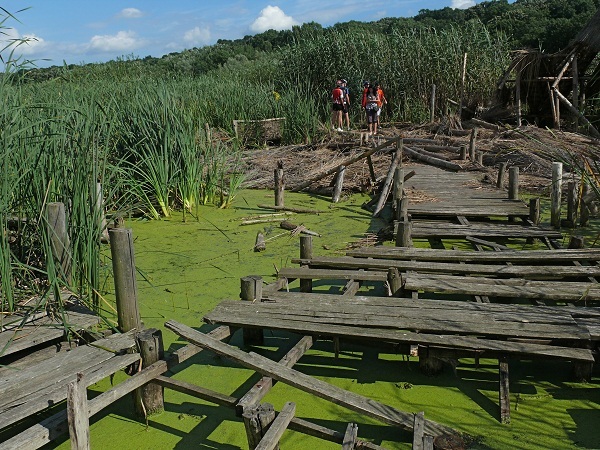 It requires caution – everything is rotten and you don't want to fall in to that vegetation. 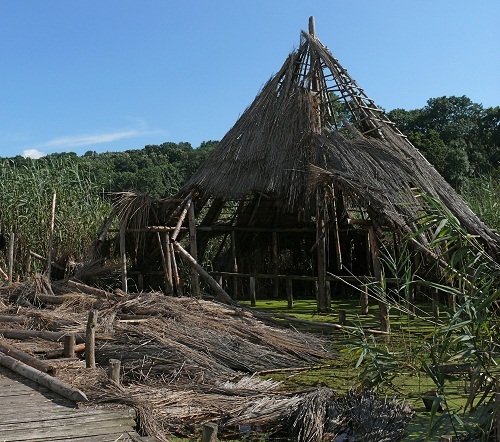 I had read on different blogs and had seen images with three lake dwellings, but there was only one of them still standing, although in ruins. A stark sight which I found fascinating. At the end of the wooden boat bridge chocked up by vegetation there was a small, charming delta. A remarkable archaic place, primitive and savage. I went back cycling in the quiet woods. After some ups and downs on the road, I met a group of bikers like myself and joined them. The 45 kilometres back to Bucharest went fast in the group ride, all bikers queued up along the road. It was undoubtedly an excellent and invigorating trip, with small expenses and close to Bucharest. Actually, there are no expenses at all, if you already have a bike.